I got this project where I need to make a hallway long enough so that my character can walk for 25 seconds, then open a door, and then continue on walking through. However, the problem is that the hallway part is due first and then the character will be due latter. Therefore, I am having problems figuring out how long my hallway should be. 1. Try using the motion path. Howevr, nowhere did anyone explained what is suppose to be attached to the curve. So I tried both ways. First I tried attaching the root bone to the curve, but the program said that it couldn't attach the root bone to the curve because the root bone already had a translateX conntected somewhere else. So then, the last thing I tried was attaching the character group node to the curve, which it did attach, but the character didn't move. 2. Then in another thread, someone once said that you would need to make a clip, and then place the clip in the trax editor. In addition, this person also said that he/she only knew very little about using the trax editor, and all he/she could understand about it was from the book called Maya's Fundementals 5. Well, I have this book as well, and I tried watching the video as well as reading the book, but it doesn't explain much about this topic. Basically all it said was that first, you select all your keyable nodes. Next, you create a new clip, and then you will be able to paste that clip onto the trax editor, but that was all it said. However, I still tried do this by following the book's instructions, but the character still walked in place for 25 seconds like he is doing the MC Hammer dance. So my question is, how do you get a character to walk from point a to point b? well I found some things on what I was doing wrong. Basically, from watching another tutorial which talks about using Maya's nonlinear animation tools, you are suppose to select all of your keyable animations and then create a new clip. Then you can open the Trax editor, and setup your clips in there and then you will be able to play your animations. So considering that I found out what I am suppose to do, and because I can't rember which nodes are keyable, is there a way I could see a timeline of all my keys at once? Well, once again, while waiting for a reply, I tried doing what the video shows, and my charater still walks in place. So what gives and what am I doing wrong? I followed exactly to what the video shows. Is it possible that someone could give me an idea how to make the character not to walk in place? Am I suppose to connect the character to a motion path? However, the video doesn't say you need to do this. The Dope sheet will show all of your keyed attibutes for the character. So will the graph editor. You could attach the root joint of your skeleton to the path that you set up. I'm not infront of Maya right now but I think you select the joint then select the NURBS curve that is going to be your path then click "make path" or something to that affect. I used paths before and they work well. You can speed them up or slow them down by playing with the length of the path and also by adjusting the curve in the graph editor. You don't really have to use a path if you don't want to. 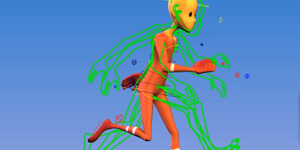 Assuming that your skeleton is animated walking in place then all you have to do is keyframe the translation of the root join from its start position to its end position. If you don't have the thing walk at the proper rate, the feet will appear to be sliding on the floor so pay attention to that. Good luck. Thanks Velusion. I will give this a shot later on and let you know how it works out.